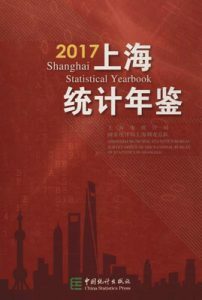 Ⅰ.Statistical Yearbook of Shanghai Pudong New Area(PNA)—2017 is a large,comprehensive reference book.With great amount of data and in both Chinese and English versions,it records recent years’ social and economic development in PNA.It describes the changes in economy,society,science and technology,and key development zones in PNA’s new stage of “Second Startup for Business” in 2016.It is a desktop tool-book meant for leaders at all levels,theorists,practitioners,and people at home and abroad who are interested in PNA,want to do research work on Pudong and intend to participate in its development and its construction. Ⅱ.Great changes happened to the administrative system of Pudong New Area in 2009.On April 24,the State Council approved to add the administrative area of Nanhui District into Pudong New Area.On May 6,the Shanghai Municipal government formally announced the combination of these two districts.Because of data of previous years in these two districts can not be added simply while they had been produced with different statistical methods,approached and areas and it is hard to trace them.Unless specified,the statistical data in this Yearbook are those of new PNA(including former Nanhui District) since 2009,and the data of previous years are those of former PNA. Ⅲ.In 2011 and 2012,administrative divisions of some towns in PNA were readjusted.On October 28,2011,Shanghai People’s Government approved the establishment of the new Chuansha New Town after rescinding the former Chuansha New Town and Liuzao Town,approved the establishment of the new Zhuqiao Town after rescinding the former Zhuqiao Town,and readjusted the administrative divisions of these two new towns.On August 30,2012,the municipal government approved the establishment of the new Nanhui New Town after rescinding Shengang Sub-district and Luchaogang Town,and readjusted its administrative division. Ⅳ.The annual average growth rate in this Yearbook is extracted from the multiplication of the annual chain growth rates. Ⅴ.This book falls into nineteen chapters:1.General Survey;2.Population;3.Investment in Fixed Assets;4.Business Promotion and Foreign-fund Attraction;5.Agriculture;6.Industry;7.Construction;8.Finance and Banking,and Factor Markets;9.Real Estate;10.Domestic and Foreign Trades;11.Services,Tourism and Hotels;12.Science and Technology;13.People’s Livelihood;14.Employment and Social Security;15.Education;16.Culture and Sports;17.Public Health;18.Laws,Public Order and Others;19.Urban Construction and Environmental Protection;20.Key Development Zones and Sub-districts and Towns;21.Statistics of Shanghai Municipality. Ⅵ.The units of measurement in this book are consistent with international standards. Ⅶ.No adjustment has been made to correct the deviations of some of the figures in the Yearbook caused by different methods used in rounding. Ⅷ.In November 1995,PNA rescinded township system and adopted town system.Villages are supervised by towns in the town system.Therefore,in this book,the meanings of “town” and“town and town-above industry” are the same as“township” and“township and township-above industry” in other Chinese statistical books. Ⅸ.Notations used in this Yearbook: “#”indicates the major item of a certain indicator, “…”indicates the figure which is too small to be measured by the smallest unit in the table, “blank” indicates the data unavailable or none in certain statistical indicator. Ⅹ.According to relevant stipulations by the State Council and National Bureau of Statistics,GDP of Pudong New Area is to be renamed as Gross Output Value of Pudong New Area,shortened as PNA Gross Output Value starting from 2004. Ⅺ.All added values and gross output vales in the Yearbook are listed in terms of current prices while growth rates listed in terms of comparable prices. Ⅻ.If any statistical data from other sources conflict with the data in the present Yearbook,datain the present Yearbook shall apply. ⅩⅢ.The publication of Pudong New Area Statistical Yearbook has received great attention.Our gratitude and appreciation go to all the readers who have offered their comments.We welcome and are open to more comments and suggestions from our readers when presenting this new edition. We appreciate the great support and efforts of Shanghai Statistics Bureau,all the commissions,offices and bureaus,and administrations of all the development zones in PNA during compilation of the present Yearbook. Shanghai Statistical Yearbook 2014 contains comprehensive statistics of Shanghai’s social and economic development in 2013 and selected data of some important years and of the period since China adopted the policy of reform and opening to the outside world.